While attending the ECELC Healthy Eating Learning Session, Lisa McCleish, the Director of Early Childhood Programs at the Country Club Christian Church in Missouri, created a fun idea called “Cooking Camp!” The program’s philosophy includes planning experiences for children to be actively engaged in their learning. In the Cooking Camp, the children will choose to join the activities based on their interests and readiness. For example, children will have the opportunity to draw fruits and vegetables or other healthy recipe ingredients if they love art. In the dramatic play area, they will be able to set the table, cook and serve healthy “play” food and beverages and also enjoy family style dining as they see it. In the literacy center, children can create cookbooks or an individual book about their experiences with healthy eating and beverages. In addition to the Cooking Camp, many of the discussions shared through the learning session and staff training will be incorporated in other weekly camps that have been offered in past years. For example, the Music Camp has evolved into Music and Movement Camp and will now offer additional ways for children to be active. They will also have a Camping Week, where they can explore nature and the benefits of being outdoors. The campfire treats will also be tweaked to include healthier options. 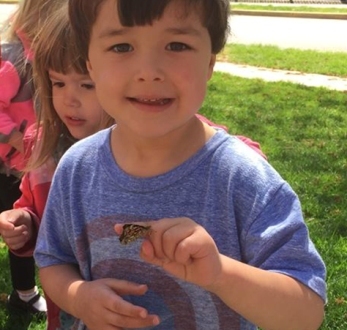 Long Island Farm to Preschool provides food-related lessons for children at participating centers in the springtime, while also assisting in setting up garden beds on school grounds. Children help tend the gardens and often attend market with their class or camp group. Program Head and Registered Dietitian Dana Youkilis visits each center to teach the children about gardening and the plant life-cycle through reading stories, hands-on activities and tastings. The learning collaborative model brings together a large number of early care and education (ECE) programs to participate to make quality improvements in a focused area. The collaborative model is powerful because it brings together a community of learners, creates a network of shared ideas and mutual support, provides access to high-quality resources for quality improvement, and offers opportunities to build important skills.